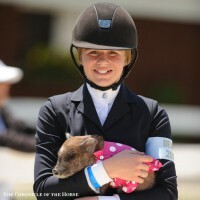 Coco The Horse Show Pig loves to cuddle with her owner, Ellie Ferrigno. Photo by Mollie Bailey. Ellie Ferrigno has had a hard time getting around the Devon showgrounds efficiently this week. After all there are plenty of people at horse shows who carry around Jack Russell Terriers or Chihuahuas, but she’s the only one here with a mini pig in her arms. Coco The Horse Show Pig is just shy of 7 months old, and when she’s full-grown she should be about 25-40 pounds. “Someone suggested a Facebook page to me, AZ Micro Mini Pigs, and as soon as I saw it I was obsessed,” said Ferrigno, who lives in Newtown, Conn.
Coco The Horse Show Pig helped Ellie Ferrigno celebrate her first equitation ribbon at Devon. Photo courtesy of Abbi Seley Ferrigno. Ferrigno’s mother, Abbi Seley Ferrigno, fell for animals too, and soon Coco joined their four dogs as the family pets. Two of the dogs are scared of Coco, and one wants to eat her. The fourth dog, Pudding, is her buddy, and he lets her pile on top of him. Coco learned to use a litterbox during the chilly Connecticut winter, and while the dogs have an occasional accident inside, Coco hasn’t. Coco and Pudding cuddle at home. Photo courtesy of Abbi Seley Ferrigno. While Coco’s a horse show pig, she doesn’t join them day-to-day at Abbi’s Rabbit Hill Farm. She eats mini pig pellets and the occasional strawberry as a treat, and she visits small animal vet who specializes in exotics for check-ups. Coco didn’t used to enjoy getting dressed up, but now she has much more fashion sense. Photo by Mollie Bailey. Coco has quite the repertoire of noises, ranging from oinks to barks to growls to squeeks to honks. Her favorite people are Abbi and Ellie, and he spends his nights cuddling with Ellie. “She comes to the side of the bed and yells at me, then she comes in and is really snuggly. You can follow Coco The Horse Show Pig on Instagram, and while you’re at it, make sure you’re following the Chronicle too. He’s not the only horse show pig—catch up with Wibur, Georgina Bloomberg’s rescue pig. Want more fun things from Devon? Check out this story about Trading Aces, the equitation horse who’s been to the Alltech FEI World Equestrian Games—for eventing! Follow along with the Chronicle for lots more news, features and photos from Devon. Find out thesecrets to R.W. “Ronnie” Mutch winner Hunter Holloway’s success, and check out photos from Day 1 of junior competition, and follow us on Twitter and Instagram for lots more fun. Check out the June 8 issue of The Chronicle of the Horse for news and analysis from Devon Junior.